The Bodhisatva image at Dambegoda has been identified as the Bodhisatva Avalokitesvara, the most important Mahayana deity worshipped by the Buddhists in Sri Lanka when the cult of Avalokitesvara attained its zenith in the 11th century. According to Mahayana Buddhism, Bodhisatva Avalokitsvara is the Lord of compassion and the most powerful manifestation of Amitabha the celestial Buddha presiding over the present world and he is the symbol of the universal Brotherhood and Salvation. The Bodhisatva Avalokitesvara, functions in the role of a saviour of mankind under the auspices of the Buddha Amitabha whose effigy he bears upon his crown. The two manuscripts written in Nepal in the 11th century, mention of the worship of Avalokitesvara as the Divine Healer which was prevalent in the 9th century in many Buddhist countries, including Sri Lanka. This reference in the Cylavamsa to Kanagama (blindman’s village) where hospitals for the blind and the sick were built has been identified as Maligawila and Dambegoda dedicated to the heavenly guardian of the sick and the infirm. The image at Dambegoda is surrounded by a thick jungle with tall trees of black ebony, yellow satin and ed amarind under which wild elephants roam freely. This area can be reached by road 250 kilometres from Colombo and it is on the northern border of the Yala Wild Life Santuary. The closest village can be approached by a kilometre on a cart road. 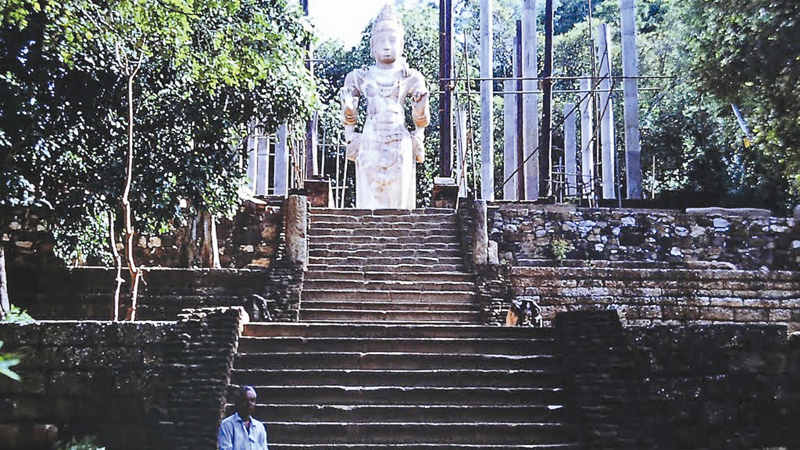 The ancient route linking the two major capitals Anuradhapura in the north east and Tissamaharama in the south east passed by close to Dambegoda. This area dates back to pre-Christian times with its image house of the Bodhisatva has been built on the notch of the small hillock rising about 100 metres above the plain facing the north. There are many Brahmi inscriptions belonging to pre-Christian times carved on the drip ledges of the caves which name the rock shelters used by the Buddhist monks in the past. Both Maligavila and Dambegoda at first formed one monastery complex with residential units for monks and they are positioned between these two units. The dwelling complex of the monks was similar to the type of buildings of the Anuradhapura period with a courtyard of high walls and five residential units. The central unit was used by the chief monk for his living and teaching. The storey above was the library. The four side storied building could each accommodate six pupils or a total group of twenty four pupil monks. The Dematamahal Vihara of the 8th century with its Panchavasa monastery lies within eight kilometres form Dambegoda. Yudaganava with its incomplete stupa dated to the 12th century is 20 kilmetres away from Dambegoda. Buduruwegala with a group of seven colossal Mahayana statues belonging to 10 and 12th centuries. The sub-capital of Galebeda of the 12th century is within 40 kilmetres of Dambegoda to the west and east. It is also believed that this saviour through whose grace and compassion decrepitude and disease will come to an end. These beliefs of Mahayana Buddhism gained ascendance in Sri Lanka to increase the divine protection and healing powers of the hospitals for the benefit of the destitute and infirm, rather than Avalokitesvara to take over the function of the Buddha, the sublime Lord of the Sinhalese Buddhists, whereas in Cambodia, in early 13th century the cult of Avalokitesvara as the divine healer, royal hospitals were shifted from the spiritual care of the Medicinal Buddha to the supreme protection of Avalokitesvara. The miniature Buddha on the crown of the Dambegoda statue is identified as Avalokitesvara, the Lord of compassion and the Divine Healer of Mahayana system of Buddhism. The Dambegoda colossal figure stands on a pedestal in the posture known as Sambhanga reflecting majestic dignity, steadfastness, strength and power. Both hands are raised in the Katakahasta – a gesture symbolic of holding a flower which generally symbolizes benevolence. This hand-pose displayed by the Bodhisatva may indicate the presence of the red lotus which meant purification and spiritual awakening. The use of the double Katakahasta, however may have been a development of the regular iconographic formula applied to the images of Avalokitesvara in Sri Lanka. The left hand of the image shows the Katakahasta and the right hand suggest the gesture of teaching. Avalokitesvara images displaying the double Katakahasta are fairly rare but the Buduruvegala is an exception. The Dambegoda Bodhisatva wears rich attire and many ornaments, complete with a long Yajnopavita, the sacred thread to indicate his social status. The elaborate crown and the full set of ornaments underline the Bodhisatva’s regal and divine nature. The ascetic and priest-like traits of the figure form another facet of his personality. This has been reduced to the minimum by the display of stylized hair locks, barely visible among the ornaments. There are other Avalokitesvara figures namely Kustaraja image at Weligama and a few bronzes found at Tiriyaya show this regal form. The Avalokitesvara figure at Buduruvegala, Weligama and Tiriyaya are within the same span of time. However the Dambegoda Bodhisatva surpasses the colossal figures of Buduruvegaala and Weligama not merely by its size but more by its finely conceived proportions, its majestic pose and its sublime facial expressions. Aesthetically too, it is the finest sculpture portraying the skill and workmanship of the ancient stone carvers in Sri Lanka. The interest of the Dambegoda statue was roused when Boisselier visited the site in 1970. Later the Federal Republic of Germany showed an interest in a cultural project in Sri Lanka. Reider from the museum in Berlin visited the site which the Archaeological Department had already undertaken for excavation. Thereafter it was begun as a joint venture in 1980s to conserve the 9th century Bodhisatva image and restore it to its pristine form for the centenary of the Department of Archaeology in 1990.